“The water was not even fit for cooking,” said homemaker Rekha Atolia. “Tea would get curdled. Dal would not cook,” the northern India native added. Two thirds of Indian terrain has no perennial river flowing through it, which means that two thirds of the population relies on untreated ground water that is often contaminated. Many lives are lost to diarrhoea or renal failure caused by high levels of fluoride. The Ajay G. Piramal Foundation, the social responsibility arm of the Piramal Group, started a project to get clean water to the local population in the city of Bagar, Rajasthan. 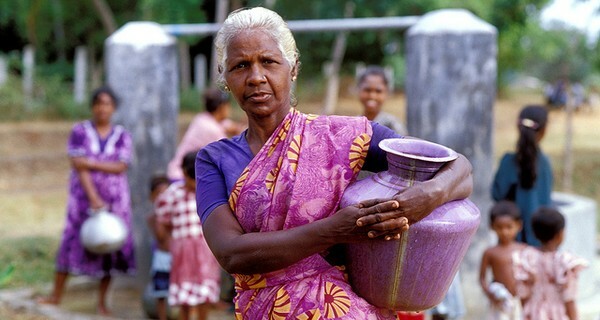 They installed 24/7 Water ATMs, which allowed people to fill up their own containers with clean and affordable water, using a pre-paid card or coins. Since a water ATM was installed in her area, Rekha has been able to take out a plastic card and hold it in front of the ATM’s sensor, which shows a balance. She can place a 10-litre container under the spout, and press a button to fill it, releasing it when the container is full. The machine calculates the amount of water dispensed and charges the card. One litre costs just 50 paisa, and the technology uses Global System for Mobile (GSM) communications, which means the company can keep track of all machines remotely, monitoring water quality and any damage to the system. Every machine is also thoroughly inspected once a month. 20 machines have been installed in 12 states across India so far. The company also runs a charitable programme where donors can ‘adopt’ a village to provide the inhabitants with clean water, and is currently looking for volunteers.